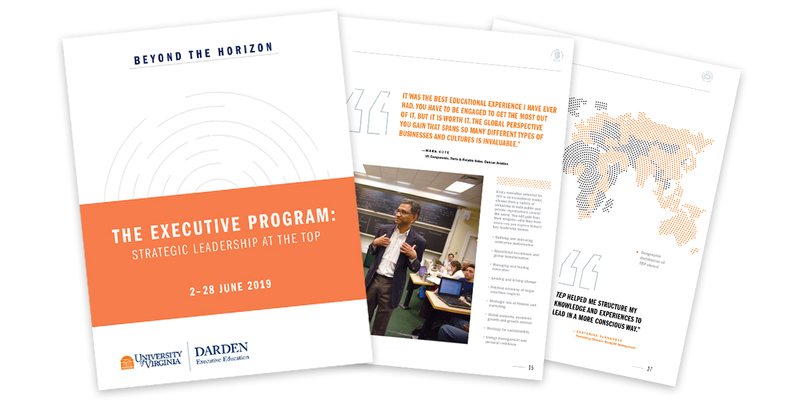 The Executive Program (TEP) is reserved for senior executives with advanced management experience—leaders who engage in business at the highest levels of risk and reward. TEP offers a global leadership experience like no other, providing a forum for top executives from around the world to come together and explore universal challenges and solutions, helping them lead their organization in today’s complex, global marketplace. Complete the form to download the brochure and learn more about the program, Darden's unique approach and experience, the faculty team, as well as key topics, themes and takeaways.